As promised, here’s how my truck-cleaning effort went. The entire process took 1 hour, although I did not vacuum (since our cordless went with my husband the day I did this). Most likely the time for pictures and setup this time around would offset cleaning time for a normal routine. 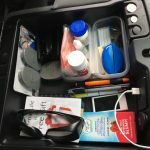 Since I have a truck, the interior storage is primarily under the back seat and in the console. I tackled the largest area first! Before are pictures of the space, all the stuff originally in it, and the final arrangement. I put all my extra shopping bags in one bag, which fits nicely in the shallow middle. The pillow and picnic blanket went in one well. My road trip guides and other books went in the other well. The umbrella and ice scraper went on the ledge in the back. The insulated bag is on top of it all on the driver’s side, because that is what I grab most often. Since several tools and notepads and other items had accumulated since the last cleaning, I took those and put them in the appropriate areas for when I got there. This started out pretty ugly; we use this most often when driving because it’s easiest to reach. The keys here are to 1) only have what you need handy and 2) contain the small items. I stacked the flat books and iPod. Medicine and keys/bobbypins/money went in two separate cheap plasticware boxes that I pulled out of the kitchen drawer. The manual went in the glove box and the napkins went in the grab bag (seen later). I love the deep pockets in the doors. My driver door has my favorite shopping bags, because usually I only use two or three, and gum. The other side has activity books for traveling and the GPS. Here I simply had to take out the trash and stuff that had migrated to the wrong section. Because of the limited storage, I like to keep a tote bag with various things handy. Mine sits in the middle of the back seat (on the hump), but it is easy to move temporarily if the back seat is full. This is where the food items (snacks, napkins, straws), wipes, towel, emergency toy, and such are stored. It is arranged so I can reach in and get what is needed without searching or unpacking. 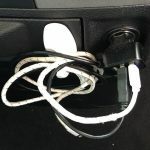 This time around, I used an idea from Pinterest browsing to corral the charging cords that typically spread all over the front. A Command hook next to the charger worked nicely. Also, I always have a trash bag in the middle of the front seat. Sometimes it is a small plastic bag. A box or cereal storage bin or cheap car accessory works well also. The important thing is that it is handy and used (and emptied occasionally…). The back of the truck has the big stuff, since it is available. 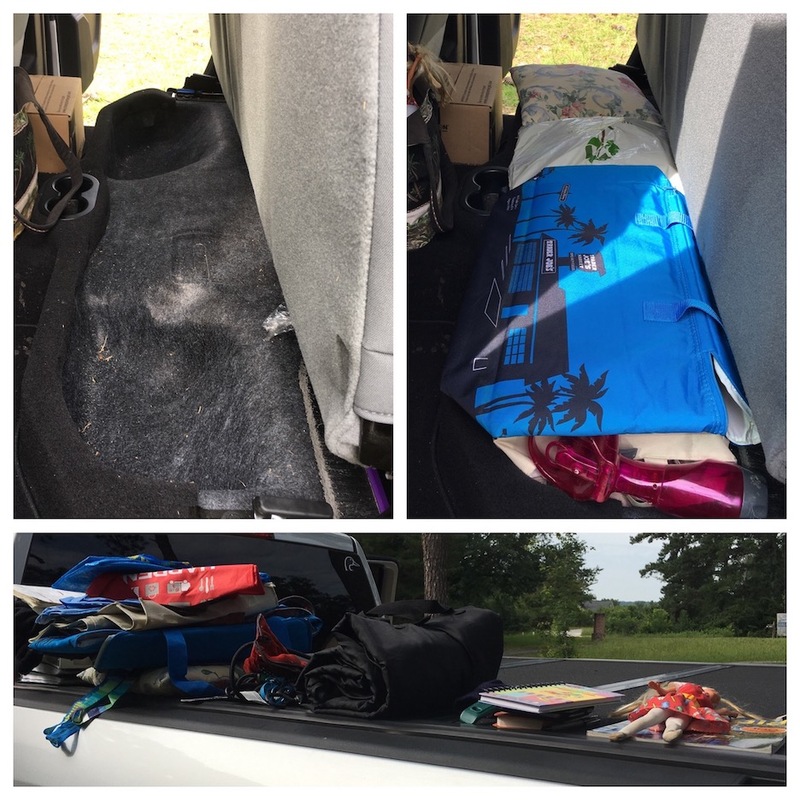 Two lawn chairs, a tool box, and a tote to hold anything needed for transport are what stay in the back. 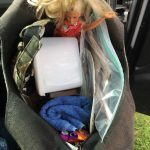 The tool box and tote contain smaller things that would otherwise just float around and scatter while driving. They are both easy to grab for use when needed. I hope this encouraged and helped you — or will someday in the future. Nothing I did required a trip to the store; I just used what I had. You can put more effort and money into it, but it isn’t necessary in order to keep to the organizing principles. Best wishes on your efforts in this area!